It would seem that they've figured out how to write opening episodes. The first season had a good atmosphere, but got bogged down with character introductions. The second season managed to throw us into the thick of things at a steadier pace, but forgot the atmosphere. This episode is refreshingly slow, taking time for moody cutaways, dramatic tension and glimpses of characters that won't be important until later. From here on out, season premieres are much smoother works. Can't say the same for episodes 2-6 of every season, but episode 1 won't be such a problem anymore. The real meat of the episode is the introduction to Takato. At first glance, he doesn't fit the goggle boy mold of Tai and Davis. He's not even wearing goggles at all. He's young, awkward, kind of a runt and a daydreamer. He's not the outgoing brash leader the way Tai and Davis were. The key similarity uniting these three: they're all idiots. Oh, Tai had his moments of brilliance and Davis had the amazing ability to derive the correct result from incorrect methods, but they did a lot of stupid things. Takato's stupidity is more subtle, having to do with the way he expresses his passion for Digimon. Ain't nothing wrong with being a fan. And Takato is certainly a fan, playing the card game before school and dreaming up his perfect Digimon. After playing, he sees a strange blue card in the deck and slashes it through his (probably expensive) card reader. The sucker shorts immediately, as electronic devices are wont to do when interfacing with something it shouldn't interface with. He's late to school as a result and while standing outside as punishment, he spaces out and starts creating the most simple-minded, elementary Digimon out there. He's based off the coolest Digimon, but red because it's cooler and he's bigger and has claws and has this badass fireball attack that should be too strong for Rookies but not this one because he's so cool! I think I've seen this kid on Tumblr. 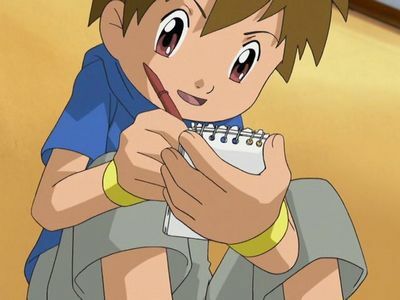 His card reader does not break, but rather turns into a digivice, which Takato takes to mean that he's going to be a new digidestined... then tries to break the digivice by scanning the whole damn notepad with Guilmon's information. Not a bright one, this kid. 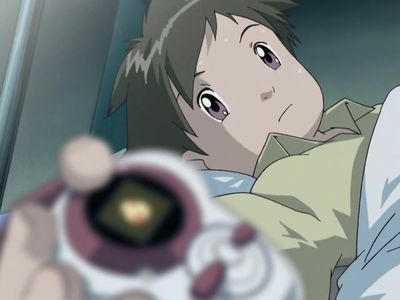 Takato goes to bed imagining how wonderful it will be as a real digidestined with his very own Digimon partner to have fun with, all while his digivice serves as an incubator. Insert Madoka reference here. After a strange dream where he witnesses Rika and Renamon killing a Lynxmon, Takato spends the next day hunting down his creation. The mood here is fantastic as he ends up dirty, lost and grossed out. He witnesses Guilmon bio-emerging, then quickly realizes the flaw in giving him a badass fireball attack that should be too strong for Rookies. Guilmon is very much a newborn, and I doubt Takato spent too much time developing his personality. If he did, it would probably be something like “ferocious monster with a cuddly side.” Right now, Guilmon's fresh-faced in a world that he has no experience with, and he seems to be set on blasting anything that moves. You have to appreciate the clever casting with Miss Asaji sharing a voice actor with Kari. Fans used to speculate the maybe she actually was Kari, but as we'll see later once we get to know Asaji a little better, it's most definitely not. The electrical storm as Takato receives his digivice creates a nice eerie feel, although the spinning clock on the dinosaur hiding place is a bit much. It's not likely that he traveled through time, but why give that impression? Note that while Takato is clearly thinking that he's going to be a digidestined, he doesn't actually say the word. Good to get away from that terminology. At the same time, if Digimon are perceived to not be real, how does Takato know what a Tamer is? The dub goes well out of its way to emphasize how ominous the “Hypnos towers” are, through music and a line from Takato. While they certainly look intimidating, it's pretty much city hall. The Tokyo Metropolitan Government Building is seen in a bunch of different anime (including Adventure) and not usually some creepy monolith of power. Takato's class has probably taken field trips there. The dub also adds in references to the TV show existing in this universe, where the Japanese kept it to the card game. This is a good thing, as it's one thing to believe in a digivice scanning handwritten doodles and generating a Digimon off them... but believing that kids actually play the Digimon card game is quite a stretch. Technically the term tamer was around before even the creation of the digimon anime. It originally came from the first V-Pets. In fact the very first digimon manga which started publishing a year before Adventure was known as Digimon V-Tamer. Honestly I found Takatos design fore Guilmon not stupid at all. I am not that big of a Fan of Dinosaurs (which is weird since I like Dragons) but Guilmon looks pretty cool. 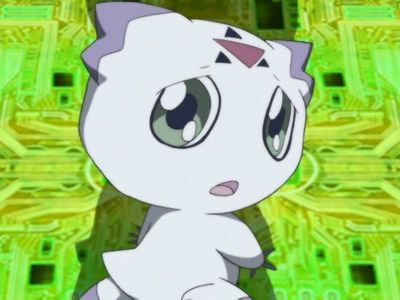 And while his attack is a bit above average Rooky Ranamon is pretty strong too and Lucemon who by the way is also a Rooky level Digimon has a Attack that is better than what the average Megalevel Digimon and even low tier Royal knights have to offer. So yeah there is nothing really wrong with Takatos design fore Guilmon.